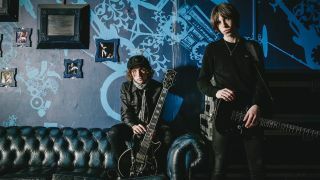 Van McCann, frontman for Llandudno indie-rock heroes Catfish And The Bottlemen, says he once attempted to hand the band's demo to Kasabian's Serge Pizzorno. In an interview in the upcoming issue of Total Guitar, Van reveals that Serge wasn't exactly willing to give Catfish a listen, so the band adopted their own unorthodox distribution techniques. "We used to try everything! I remember trying to give Serge from Kasabian a demo when I was 15 and he said no. We were trying to sneak into his gig at Manchester Apollo as a support band, so we got a generator and revved it up outside and, as the venue opened the fire escapes, we had 2,500 people in the car park bouncing while our mate was giving CDs out. "If we got stuck in traffic on the motorway, we'd walk up the line and give CDs out to all the cars. Then we'd just wind people up and get in the magazines and have a laugh. They'd always have to write about us because it would be like, 'Look at what these pricks have done now!'" For the full interview with Catfish And The Bottlemen, check out Total Guitar issue 268, on sale 5 June. Get a copy of TG on iOS.